Together we can dismantle the School to Prison Pipeline! Share Your Story! Download our School-to-Prison Pipeline fact sheet in English and Spanish. The “school-to-prison pipeline” is a disturbing national trend wherein children are funneled out of public schools and into the juvenile and criminal justice systems. This is enabled by policies and practices from the school to district, state, and federal levels. Many of the children most impacted by this “push out” have learning disabilities, histories of poverty, abuse, or neglect, and would benefit from additional educational and counseling services. Instead, they are isolated, punished, and pushed out. 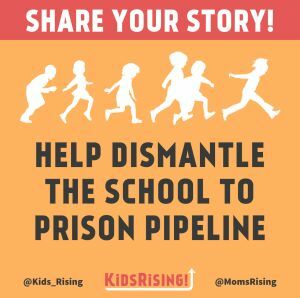 MomsRising is working to dismantle the school-to-prison pipeline from the point of suspension to the point of youth incarceration. We're challenging the practices and policies that push students out of schools and into the juvenile and criminal justice systems. When we work to dismantle the school to prison pipeline, we open up opportunities to advance the cradle to college pathway. #GoodNews This Week: Paid Leave, Gun Safety, KidsRising! UPDATED! Let Cyntoia know you are with her! In Honor of Her: Venida Browder and her fight for justice told by her son Deion Browder. Share your story and help us dismantle the school to prison pipeline. Are you a teacher working to end the school-to-prison pipeline? Tell us your story!